You'll be right on trend with this charm that can attach to your bracelet or necklace, to add another dimension to that layered look! Jane Marie is dedicated to making women feel beautiful through its collections of vintage inspired, trend driven jewelry. Women of all ages love the unique and affordable vintage chic collections of Jane Marie. Each piece is designed in the U.S. to make it a one of a kind gift for yourself or another, one that is sure to charm. Shiny silver and Gold tone. 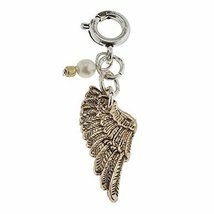 Charm width is 3/8 inches wide.